For all other inquiries use the form below! 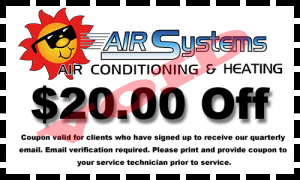 Air Systems Texas is a qualified AC & Heating service located in the Friendswood area. We service a large area and offer a guarantee on all of our services. Please call us for all of your AC/Heating needs. We appreciate your business!